Since the Charlottesville attack a month ago, a review of commentary in the six top broadsheet newspapers—the Wall Street Journal, New York Times, USA Today, LA Times, San Jose Mercury News and Washington Post—found virtually equal amounts of condemnation of fascists and anti-fascist protesters. Between August 12 and September 12, these papers ran 28 op-eds or editorials condemning the anti-fascist movement known as antifa, or calling on politicians to do so, and 27 condemning neo-Nazis and white supremacists, or calling on politicians—namely Donald Trump—to do so. For the purposes of this survey, commentary that drew a comparison between antifa and neo-Nazis, but devoted the bulk of its argument to condemning antifa, was categorized as anti-antifa. There were no op-eds or editorials framed as condemnations of “both sides” that spent as much or more time condemning or criticizing neo-Nazis. The “both sides” frame—which was employed by Donald Trump in the wake of the attack, and endorsed by white supremacist David Duke—was almost always used a vehicle to highlight and denounce antifa, with a “to be sure” line about neo-Nazis thrown in for good measure. A breakdown of the op-eds and editorials can be found here. The danger posed by the extreme hard left is more about the future. Leaders of tomorrow are being educated today on campus. The tolerance for censorship and even violence to suppress dissenting voices may be a foretaste of things to come. The Washington Post* and New York Times published markedly more critiques of neo-Nazis than of antifa: the Post by five to two and the Times 13 to five. 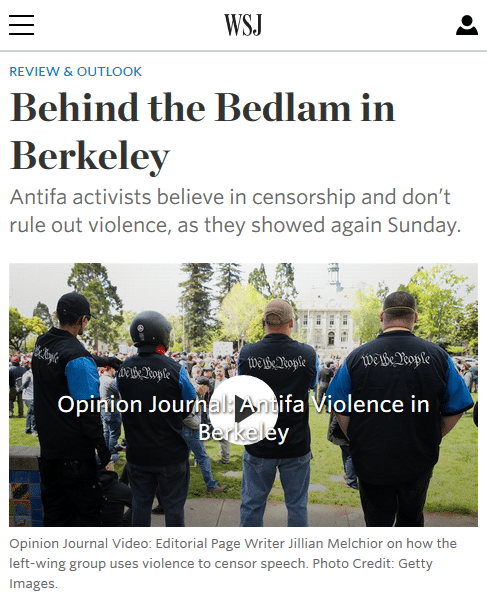 This was in contrast to the coverage in the Wall Street Journal—five antifa condemnations and no anti-Nazi ones–and USA Today, which featured seven anti-antifa pieces and only three opposing white supremacists or calling on Trump to do so. 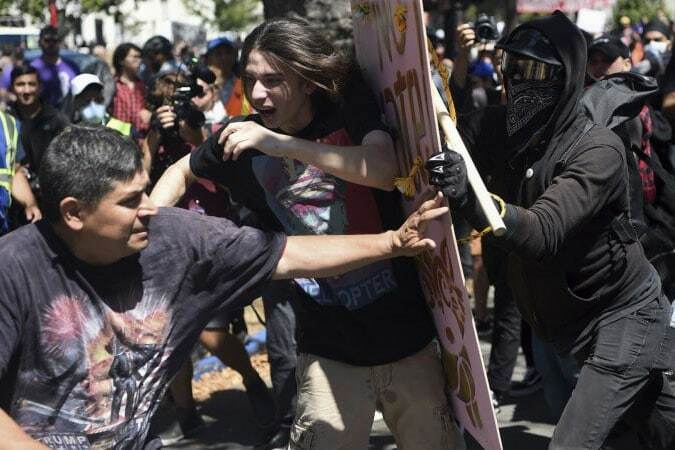 The LA Times and Mercury News were basically split down the middle, with the former publishing six anti-antifa and five anti-Nazi takes, and the latter publishing three against antifa and two against Nazis. The Wall Street Journal felt compelled to publish five pieces on the resistance to resurgent white supremacy—without publishing a piece criticizing the resurgence of white supremacy itself. Holman Jenkins’ first piece, “The Extremist Show Is Just Starting,” began with a handwave toward an “unambiguous denunciation of white racism or neo-Nazis” that, like all “both sides” takes, ended up being almost entirely a critique of radical leftist radicals—a set of priorities confirmed by a supplemental “Opinion Journal” interview with Jenkins on the Journal’s website the same day (8/18/17) that skipped the token neo-Nazi condemnation altogether and got right to the real business of bashing antifa. While the Washington Post editorial board condemned both antifa (8/30/17) and Trump’s non-response to neo-Nazi terrorism (8/12/17, 8/14/17) in equally scathing terms, the New York Times passed on the former and doubled down on the latter, issuing three separate editorials (8/13/17, 8/14/17, 8/15/17) scolding Trump and his tacit partnership with racists. Times columnist Charles Blow (8/17/17, 8/21/17, 9/7/17) was particularly consistent in calling Trump’s white supremacist support by name and shaming the broader Republican party for its role in their de facto partnership. Strangely, two of the New York Times’ five anti-antifa articles (8/17/17, 9/6/17) suggested, that people instead dress as clowns to combat neo-Nazis. 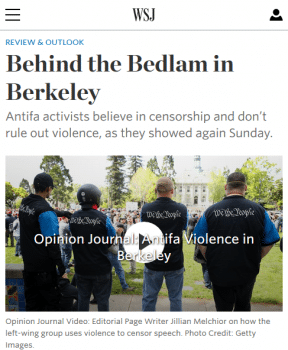 USA Today gave voice to a motley assortment of false-equivalency takes, the lowlights of which included “Media Reports on Antifa … Finally” by Rick Jensen (9/4/17) and “Alt-Right’s Despicability Doesn’t Make ‘Antifa’ the Good Guys” by right-wing provocateur Jonah Goldberg (8/18/17), who wrote a book-length “both sides” eight years ago: Liberal Fascism: The Secret History of the American Left, From Mussolini to the Politics of Change. A month after a leftist protester was killed by a self-professed neo-Nazi, it’s notable that a slim majority of opinion in major newspapers focused on those devoted to combating racism rather than to those advancing it. Bear in mind that one side kills more people than any other ideology in the country and openly promotes genocide, while the other supports aggressive tactics to prevent the promotion of genocide, and hasn’t killed anyone. As FAIR has noted before, the media’s “both sides” fetish is uniquely unsuited for the Trump era, and their peculiar evenhandedness in the wake of Charlottesville illustrates this with stark clarity. With a major publication like Politico expressly telling its reporters to avoid criticism of “physical attacks on journalists and white supremacy” on social media—so as to not appear “partisan”—one is compelled to ask, of what use is the pretense of “objectivity”? In an attempt to balance the scale, the media put their thumb on it, overemphasizing the threat of antifa while playing down an emerging far right that, in addition to having just killed someone, is in tacit alliance with the most powerful man on earth. *Given the Washington Post’s sprawling blogging vertical, only published Post articles were included.